One of the things I bought when visiting Hill Country Weavers last March was a 365 Knitting Stitches a Year Perpetual Calendar. I've used it a few times in 2007, mostly as a stitch dictionary, and hadn't really thought about it beyond that, until two days ago, when I was struck with a brilliantstupid idea. 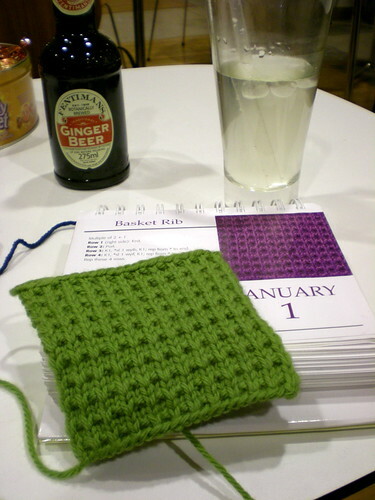 The idea being that I'd knit a swatch, every day, from my perpetual calendar (taking a day off on the 29th of February, because it wasn't made for a leap year), and I'd see how many afghans I could make. I thought about it a bit more, because I wasn't sure I could commit the time, but then I thought about it even more, and figured what the hell - I'll make the time. So yesterday, I picked a ball of yarn and a suitable circular needle, sat down and got started. I cast on 25 stitches, knit 40 rows, then cast off. It took me less time than The Simpsons Movie. Then, in the break between finishing the Simpsons Movie and starting to watch Evil Aliens, I nipped into the bathroom, gave it a wash and blocked it a little, so it could be nice and perky for it's close up, which was taken today (2nd January) at the Royal Festival Hall, where the I Knit group had chosen to have its first outing of the year.